15th December 1917: Following the revolution, Russia agreed the Armistice with Germany, thereby enabling Germany to move hundreds of thousands of men with their, guns and equipment to the Western Front. 28th November 1917: On the day that the Russians were discussing the Armistice on the Eastern Front, Trotsky as Bolshevik Commissioner for Foreign Affairs, issued an invitation to the Allies to take part. The Allies declined. 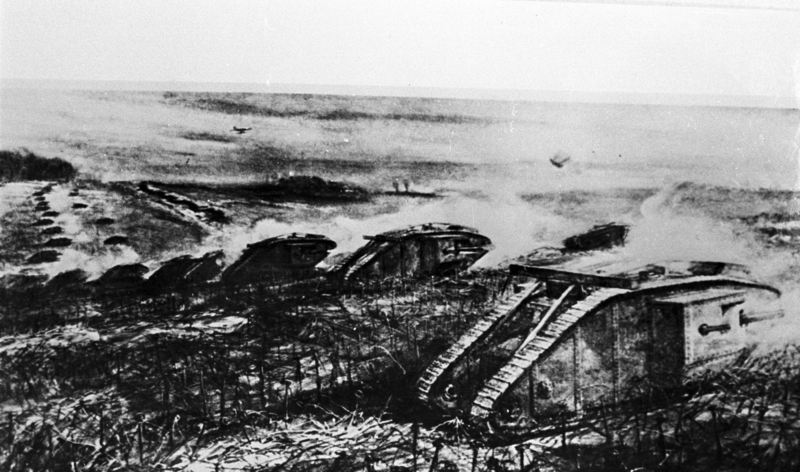 20th November 1917: The Battle of Cambrai saw the first large-scale use of tanks in WW1 combined with artillery and infantry working in tandem. Punching through the heavily barbed wired German defences the success of the tanks on the first day was then followed by failure with the unreliability of the tanks plus strong German artillery and infantry defence. Within three days the Germans realised that the Allied breakthrough had failed and they themselves looked to deliver a decisive counter-attack using their newly formed stormtrooper tactics. By the end of the fighting on the 7th December neither side had gained any significant territorial advantage and at comparable losses of about 45,000 men on both sides. 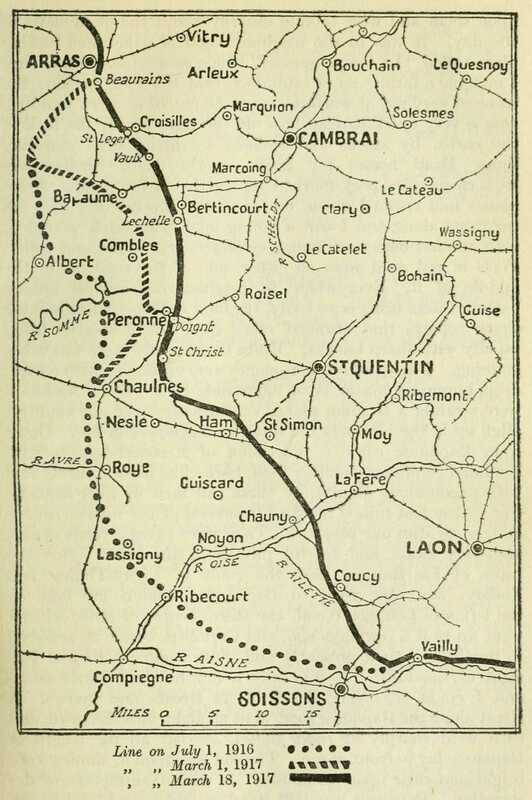 Cambrai however saw both sides put into action strategies that would lead to greater successes in the coming year. 10th November 1917: The Canadian 1st and 2nd Divisions mounted the final and successful attack to take Passchendaele. The final attack was carried out in a rainstorm. The weather, combined with a reinforcing response to the joint Austrian-German attack in Italy at Caporetto that necessitated the sending of six British divisions to bolster the Italians, resulted in the end for the 3rd Ypres offensive. Furthermore the removal of the British Divisions together with the shortage of reinforcements meant that any plans Haig had for a resumption of the offensive in the Spring 1918 were now receding. The 3rd Ypres campaign, controversial in 1917 and remaining so ever since, will forever be remembered as a campaign of ‘wretchedness in the Flanders mud’. The cautious step-by-step approach by Haig did result in territorial gains but came at a high cost of some 450,000 British and Dominion casualties, comparable to the Somme 1916 offensive, and was nowhere near achieving the initially held objective of driving the German Army from the channel coast. For the Germans, eighty-six of their best divisions took part, and with resources reaching critical their quality was never the same again. 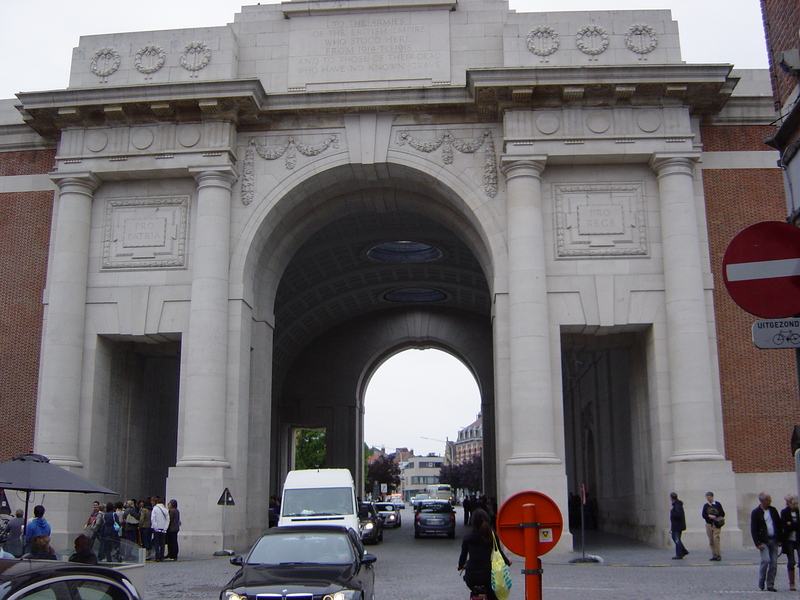 The Menin Gate Memorial to the Missing (photograph above) commemorates more than 54,000 men of all Commonwealth nations, except New Zealand, who died in the Ypres Salient and have no known grave. Every night at 8pm buglers from the local fire brigade play the Last Post to remember those that fought and died. 7th November 1917: Capitalising on the February revolution which overthrew the Tsarist autocracy in Russia, an armed insurrection led by the Bolsheviks and Vladimir Lenin took place on 25th October 1917 (7th November 1917 in the New Style) in Petrograd, leading to the world’s first self-proclaimed socialist state. The October Revolution hastened Russia’s exit from WW1, leading to the Treaty of Brest-Litovsk signed on 3rd March 1918 between the new Bolshevik government of Soviet Russia and the Central Powers (Germany, Austria-Hungary, Bulgaria, and the Ottoman Empire). 26th October 1917: The Second Battle of Passchendaele, the culminating attack in the Third Ypres campaign, began with 20,000 men of the Third and Fourth Canadian Divisions advancing up the hills of the salient. By the time the village was taken on the 10th November 1917 it had cost the Allies 30,000 casualties for a gain of a few hundred yards. 24th October 1917: Austro-Hungarian forces reinforced by German units attacked the Italians in what became the Battle of Caporetto. The attacking forces, employing the use of stormtrooper tactics and poison gas routed the Italian Army in what was one the greatest defeats in Italian military history. The reinforcing response resulted in the sending of six British divisions to bolster the Italians, and together with the weather in northern Europe on the Western Front effectively ended the 3rd Ypres offensive. Furthermore the removal of the British divisions together with the shortage of reinforcements meant that any plans Field Marshall Haig had for a resumption of the Ypres offensive in the Spring 1918 were now receding. 12th October 1917: The First Battle of Passchendaele was the last Australian attack during the Third Battle of Ypres and attempted to capture the village of Passchendaele. The AIF 3rd Division and the New Zealand Division of II Anzac Corps, with the AIF 4th Division on the flank, advanced alongside five British divisions, but were bogged down in the valley well short of their objective. For the New Zealanders this attack and day was the most costly during the entire war with 2,700 casualties. The Germans retained control of the high ground on Passchendaele Ridge opposite the I and II Anzac corps, where the attack was repulsed or troops were forced by counter-attacks to retire from most captured ground. The battle had been a German defensive success but was costly for both sides. 9th October 1917: The third phase of the Ypres Offensive began with British and French troops attacking in the Battle of Poelcappelle. Having just achieved three victories in fifteen days, the combination of heavy rains turning the battlefield into a quagmire together with a more dogged German defence brought an end to the run of success for Field Marshall Haig and his forces. 4th October 1917: I and II ANZAC fought alongside each other for the first time since their formation in the Battle of Broodseinde, the next step towards the Gheluvelt Plateau. With large amounts of artillery, and attacking on a limited front, the Australian troops successfully captured the German positions on Broodseinde ridge but at a cost of 6,500 casualties. The Anzacs were heavily shelled in their jumping-off positions before launching the attack, which accounted for a significant number of casualties. The Australians pushed through the German lines of infantry to take all of their objectives along the ridge. This was the third successful blow struck by the British at Ypres in fifteen days, driving the Germans from one of the most important positions on the Western Front. General Plumer indeed called this ‘the greatest victory since the Marne’, and at this point the British faced the possibility of decisive success. For the Germans their Official History referred to the 4th October as a ‘black day’ as they had suffered a serious defeat and losses. 28th September 1917: Field Marshal Haig announced at a conference with his Generals a change in strategy for the offensive following the attack on the Broodseinde Ridge. Up until now the advance had been made in rapid but short steps, but he now held the opinion that the Germans were becoming demoralised and running short of men and that Gough and Plumer should be prepared to exploit a successful attack and so achieve more decisive results. 26th September 1917: The AIF 5th and 4th Divisions attacked the German stronghold of Polygon Wood as a part of the Third Battle of Ypres. This was the second of the three “Plumer Battles”, a series of successful limited-objective set-piece attacks designed by General Plumer, the officer commanding the British II Army. The infantry advanced behind an extremely heavy artillery barrage and, despite suffering 5,770 casualties, gained nearly all of their objectives. 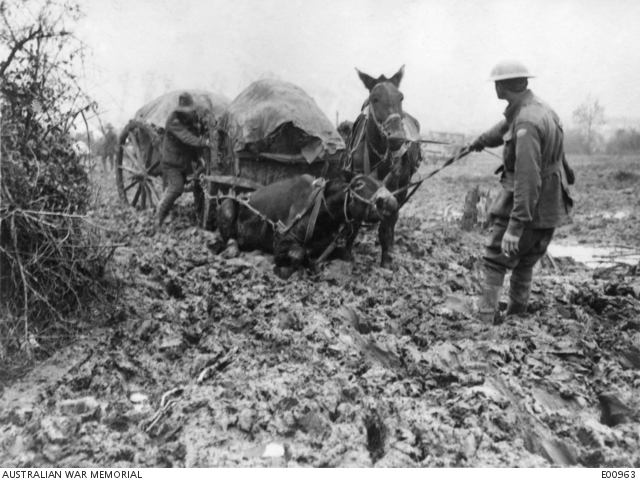 20th September 1917: The Battle of the Menin Road was the opening action of the second phase of the Third Battle of Ypres, and was the first time Australian troops were used in this campaign. Troops from the AIF 1st and 2nd divisions successfully attacked German positions near Glencourse Wood as part of a wider operation. Overcoming formidable German positions, they made considerable gains. Again, victory was not without heavy losses, and the two divisions suffered 5,000 casualties. 1st September 1917: With six divisions reluctantly taken from the commanders on the Western Front, Ludendorff was able to deliver the decisive blow on the Eastern Front with an attack at Riga which, having succeeded, made St.Petersburg vulnerable to attack. This was the final blow for the Russian people leading to their eventual withdrawal from the conflict. With one of the major allies out of the war this would pave the way for the Germans to concentrate their efforts on the Western Front. 16th August 1917: The Battle of Langemarck was the second of the general attacks in the 3rd Ypres offensive. The Allied attack succeeded from Langemarck to Drie Grachten, with the French First Army on the northern flank and the main British gain occurring near Langemarck, adjacent to the French. However early advances in the south on the Gheluvelt Plateau were forced back by powerful German counter-attacks. The Germans appreciating the tactical value of the ground concentrated their efforts in retaining the ridge through determined defence and counter-attacks. By the end of the month Inverness Copse changed hands eighteen times, and the British had suffered some 100,000 casualties for little gain in these attritional step-by-step attacks. 31st July 1917: The 3rd Ypres or Passchendaele campaign, controversial in 1917 and remaining so ever since, began with the attack at Pilckem Ridge. The cautious step-by-step approach by Haig over the 3 & 1/2 month campaign did result in territorial gains but came at a high cost of some 450,000 British and Dominion casualties, comparable to the Somme 1916 offensive, and was nowhere near achieving the initially held objective of driving the German Army from the channel coast. Although preferable to the limited, narrow front, wearing down assaults on the Somme of the previous year, the approach did have one major defect in that the attacks never went deep enough to disrupt the mass of the enemy’s artillery enabling it to retire and fight again. Despite the early successes, once the weather broke and turned the battlefield into an impassable quagmire, any thought of a decisive breakthrough had gone. Passchendaele will forever be remembered as a campaign of ‘wretchedness in the Flanders mud’. 19th July 1917: Despite the early success of the Russians on the eastern front against the mainly Austrian forces, the Russian army was not able to sustain its effort and with morale fading the Russian army buckled under a counter-attack from the German reserve and men simply melted away. At the same time the Bolshevik party obtained control of Petrograd (St. Petersburg) and by the end of July it was clear that Russia was out of the war with respect to any concerted strategic part as far as the Allies were concerned. 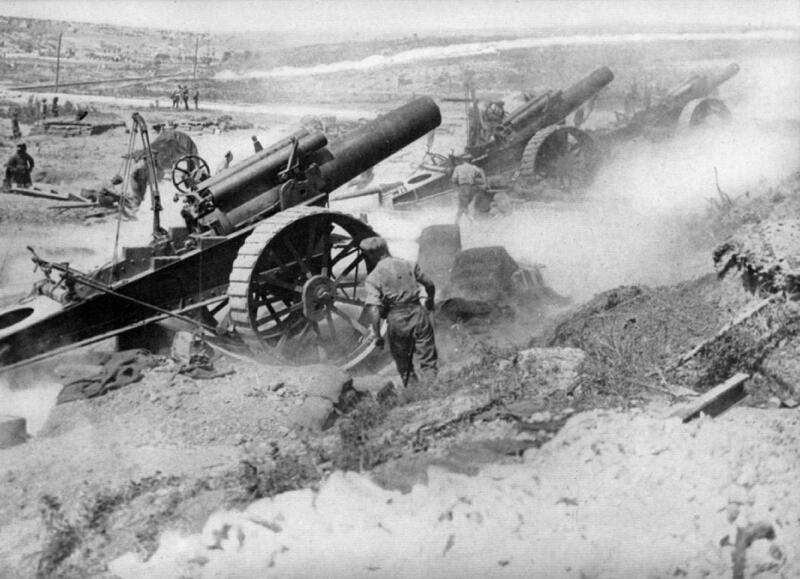 15th July 1917: The great bombardment at Ypres began, with the British guns one to every six yards of front compared to one to seven at Messines. With a total of 3,091 guns in the British 2nd & 5th Armies, this was more than at Arras earlier in the year and almost twice as many that the 4th Army had on the Somme a year previous, delivering 4 &3/4 tons of shells per yard in the last ten days of the bombardment. The summer haze plus the reluctance of the German artillery to show themselves meant that destruction of the German batteries was not on schedule thus Haig agreed to delay the start of the offensive in spite of worries of the coming rains expected in late summer. 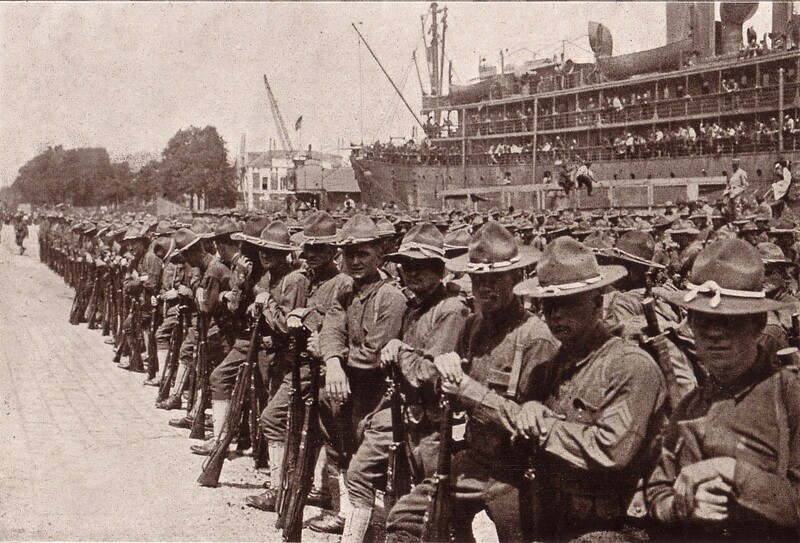 25th June 1917: The first 14,000 U.S. infantry troops landed in France at the port of Saint Nazaire. The landing site had been kept secret because of the menace of German submarines. The “Doughboys”, as the British referred to the green American troops, were at this stage untrained, ill-equipped, and far from ready for the difficulties of fighting along the Western Front. 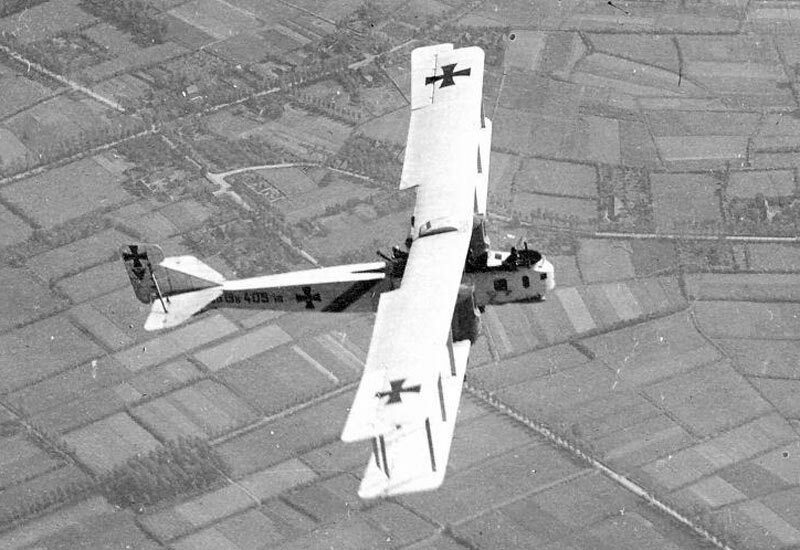 13th June 1917: Germany launched the first major heavy bomber raid over London with bombs dropped from 18 Gotha G.IV aircraft (photograph right). The attack killed 162 people and injured 432, the most during a single raid during the First World War. As a result of the raid London had a complete overhaul of its air defences including the introduction of public air raid warnings, air raid shelters and barrage balloons. 7th June 1917: The Battle of Messines Ridge – the precursor to the British 3rd Battle of Ypres (Passchendaele) offensive. Preceded by the detonation of 19 huge mines under the German front lines, including Hill 60 and Caterpillar dug by the 1st Australian Tunnelling Company, the British successfully took the ridge in what was a well executed, integrated attack. The mine explosions were reportedly heard from England. The battle also saw General Monash’s AIF 3rd Division as part of Godley’s II Anzac Corps take part in its first major attack during the war, supported by the AIF 4th Division. 26th May 1917: The Hospital Ship ‘Dover Castle’ was torpedoed without warning at 11 a.m. with 632 patients on board, including 29 officers. All the patients were saved, although three boats were destroyed by the first explosion. The ship was sunk by a second torpedo after being cleared. 20th May 1917: One of the potentially most damaging events for the Allied forces during the First World War were the French Army mutinies which started just after the disastrous Second Battle of the Aisne, the main action in the Nivelle Offensive in April 1917. General Robert Nivelle had promised a decisive war-ending victory over the Germans in 48 hours but the shock of failure soured their mood overnight. The mutinies and associated disruptions involved, to various degrees, nearly half of the French infantry divisions stationed on the western front. The new commander General Philippe Pétain (pictured right) restored morale by talking to the men, promising no more suicidal attacks, providing rest for exhausted units, home furloughs, and moderate discipline. He held 3,400 courts martial; 554 mutineers were sentenced to death but over 90% had their sentences reprieved. The mutinies had ended by 10th June but were kept secret from the Germans and indeed the rest of the world until the danger had long past. The French army was bending under the strain of the war that had taken its huge toll on the nation since 1914. As a result the new plan of Petain and Foch was a rigid defensive, with the exception of a few limited attacks to assist the British during their forthcoming Ypres offensive, until the Americans would be ready in 1918. Behind this defensive they would build up the army and an immense accumulation of material including artillery, tanks and the air fleet. 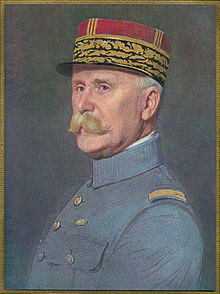 15th May 1917: Following the failure of the French Army at the Chemin des Dames and the Second Battle of the Aisne, General Nivelle was forced to retire and he was replaced by General Petain (pictured above) as the French Commander-in-Chief. General Foch was appointed as Chief of the General Staff in Paris. 30th April 1917: In the third week of April no less than 55 merchant ships – a total of 180,000 tons – had been sunk. In the month of April a total of 881,027 tons was lost. At this rate it was estimated by the end of the year that there would only be barely enough shipping to keep the British people fed, and far too few for the carriage of troops, munitions and supplies necessary to maintain the Allied war effort. 17th April 1917: On route from Le Havre and carrying their wounded to Southampton the Hospital Ships ‘Lanfranc’ and ‘Donegal’ were torpedoed, both sinking rapidly and with the loss of 40 men on each ship. At the time the HS ‘Lanfranc’ (photograph right) had 387 patients on board including 167 wounded German soldiers, of which 18 drowned. 16th April 1917: The Second Battle of the Aisne began as part of the ‘Nivelle Offensive’. After a week of diversionary attacks by the British to the north at Arras, 19 Divisions of the French Fifth and Sixth Armies went into battle along an 80 km front from Soissons to Reims. Losses were horrendous and by the end the French had suffered 187,000 casualties, triggering mutinies within the French Army and the replacing of Nivelle by General Petain. 10th April 1917: While returning to pick up wounded at the port of Le Havre, France, the Hospital Ship HMHS Salta struck a mine at 11:43, one mile (1.6 km) north of the entrance to the dam. A huge explosion smashed the hull near the stern in the engine room and hold number three. Water rushed into the disabled ship which listed to starboard and sank in less than 10 minutes. Of the 205 passengers and crew members, nine nurses, 42 member of the Royal Army Medical Corps (RAMC) and 79 crew drowned. 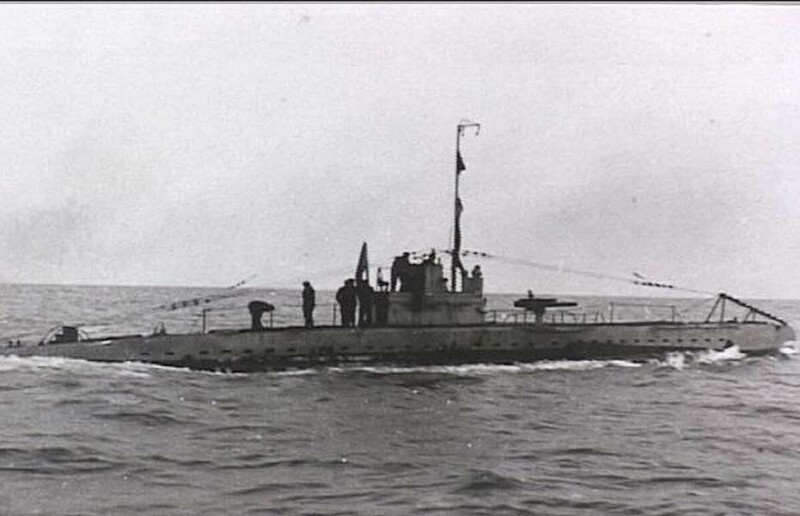 The British patrol boat HMS P-26 attempted to come alongside to assist, but also struck a mine and sank. 9th April 1917: At dawn the British First and Third Armies launched their great offensive at Vimy and Arras respectively. It had been prepared by a massive artillery bombardment greater than that at the Somme, and the infantry advanced more effectively under a creeping barrage. The attack succeeded in most of the areas and at Arras success was almost complete, taking the first two defensive systems. 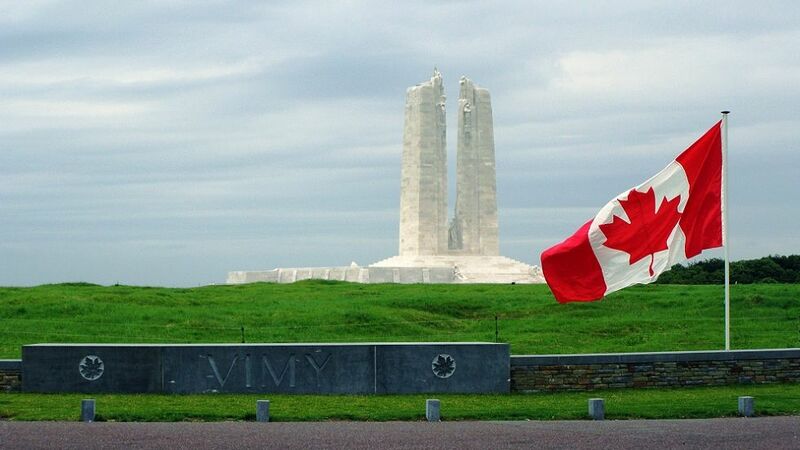 For the Canadians at Vimy Ridge this was the first time their four divisions fought together as a unified force and despite heavy losses this victorious day would be seen as key in their evolution from dominion to an independent nation. 6th April 1917: The United States declares war on Germany. On 2nd April 1917, President Woodrow Wilson went before a joint session of Congress to request a declaration of war against Germany. Wilson cited Germany’s violation of its pledge to suspend unrestricted submarine warfare in the North Atlantic and the Mediterranean, as well as its attempts to entice Mexico into an alliance against the United States, as his reasons for declaring war. 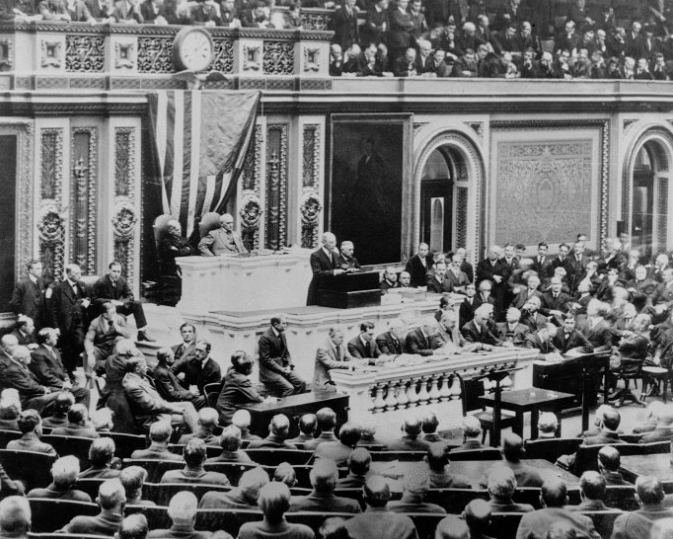 On April 4, 1917, the U.S. Senate voted in support of the measure to declare war on Germany. The House concurred two days later. Although 14,000 US infantry landed in France on 26th June 1917 to begin training, it would take at least 12 months before US troops were present on the Western Front in enough numbers to have any effect on the outcome of the war. 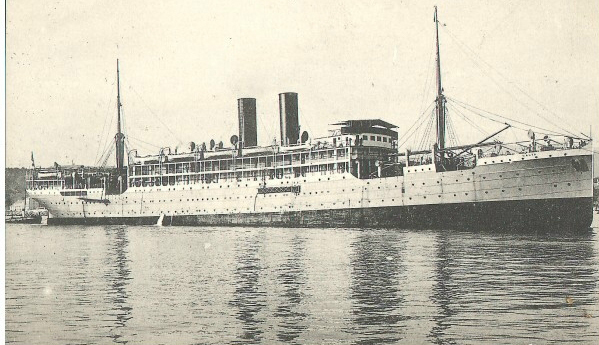 31st March 1917: The Gloucester Castle was a steam ship requisitioned by the British for use as a hospital ship during the First World War, operating in the Mediterranean between Lemnos and Malta and taking the wounded back across the English Channel from the Western Front. On one such voyage from Le Havre to Southampton on 31st March 1917 when carrying 399 patients including 300 cot cases, she was torpedoed by German U-boat U-32 off the Isle of Wight. All the patients were evacuated by the attendant destroyers and other transports, but three unfortunately died during the transfer. Although badly damaged she was eventually towed into port. 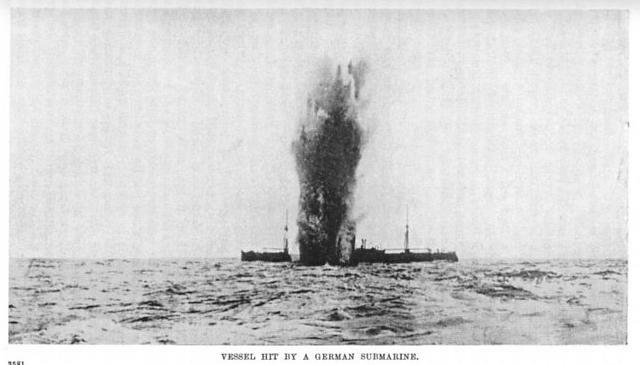 20th March 1917: In February 1915 the HMHS Asturias was hit by a torpedo but it failed to explode. However on 20th March 1917, not long after the resumption of the German announcement of unrestricted submarine warfare against shipping deemed to be supporting the Allied war effort, after landing 1,000 wounded at Avonmouth in the Bristol Channel, the Asturias was attacked by German submarine off the south Devon coast and struck by a torpedo which blew off her stern, killing 35 of her crew. The Captain of U20 which sank the Asturias was Capitanleutnant Walther Schweiger, who two years before had been in command of the U-Boat which sank the Lusitania. She was able to be beached near Bolt Head but her damage was so extensive that she was declared a total loss. However her hulk was put to use as a floating ammunition store at Plymouth for the rest of the war. them to advance into a wasteland. The British and French armies would need about eight weeks to rebuild roads, bridges and railways in the abandoned area before they could attack. A shorter Western Front could be held with fewer troops and by incorporating the lessons of defensive battle on the Somme, the importance of troop dispersal, reverse-slope positions, defence in depth and camouflage, German infantry casualties could be reduced. While the German army recuperated from the losses of 1916, protected by the Hindenburg Line and similar defensive positions on the rest of the Western Front, a return to unrestricted submarine warfare and a strategic bombing offensive against Britain were planned. 3rd February 1917: The United States severs diplomatic relations with Germany as U-Boats threaten US shipping. Intercepted messages reveal that Germany is provoking the Mexicans into war against the US. 31st January 1917: Germany warns neutrals of unrestricted submarine warfare. The German Government issued its warning to neutrals that from 1st February the waters around Great Britain, France and Italy were to be considered a barred zone, in which merchant vessels would be liable to be sunk without notice.